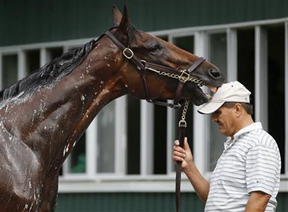 NEW YORK (AP) — Ameri­can Pharoah was made the early 3-5 favorite Wednesday to win the Belmont Stakes and become horse racing’s first Triple Crown winner in 37 years. The Kentucky Derby and Preakness winner drew the No. 5 post position for Saturday’s 1-1/2-mile race at Belmont Park. Fourteen horses have won from there, including 1977 Triple Crown champion Seattle Slew. The colt took his first steps on the dirt at Belmont Park earlier in the day, jogging counterclockwise before being walked off. “He went the wrong way, so he really didn’t learn a lot,” said Baffert, who is taking his fourth shot at one of the sporting world's toughest feats. Frosted drew the No. 6 post and was installed as the 5-1 second choice during the draw outdoors at Rockefeller Plaza, where people hung on railings watching the draw unfold. Frosted finished fourth in the Kentucky Derby and is based at Belmont Park, where he has run one race. Materiality is the 6-1 third choice and will break from the No. 8 post on the far outside. He was sixth in the Derby and has never run at Belmont, but trains there for Todd Pletcher. Mubtaahij ended up on the rail in the No. 1 post at 10-1 odds. He was eighth in the Derby and skipped the Preakness, like several of the other Belmont contenders. The top three wagering choices were the only ones listed at single-digit odds. Tale of Verve, a surprise second-place finisher in the Preakness, is 15-1. Madefromlucky, Pletcher’s other entry, is 12-1; Keen Ice, seventh in the Derby, is 20-1; and Frammento, 11th in the Derby, is the longest shot in the eight-horse field at 30-1.